After a series of singles and an EP on up-and-coming label Dirty Bingo, who were the first to bring Novella and Women’s Hour to the fore, the boys return with their long awaited debut album ‘Nothing Like Something Happens Anywhere’, a line borrowed from Philip Larkin’s famous poem ‘I Remember, I Remember’. Nostalgia, memory, confusion and regret are themes that run deep throughout the Shinies catalogue so it’s no surprise that such a title was chosen. The sunrise through squinted eyes drifty narrative of Larkin’s key poem is the perfect backdrop to the swells and swirls of their impressive shoegaze-pop debut long play. They’ve come a long way since their initial late night jams in a Manchester basement back in 2011. The DIY spirit remains but is crafted, executed and expressed better than ever before. MJ of Hookworms produced, and his stamp is understated but important, threading together narrative, a journey. This is more than just a collection of songs. It’s an etching. The story of our every day struggle for expression, for freedom, set against the monotonous hum of our zero hour contract inner city jobs. Singer and guitar player Adam Davison’s effortless pop melodies drive the LP forward. 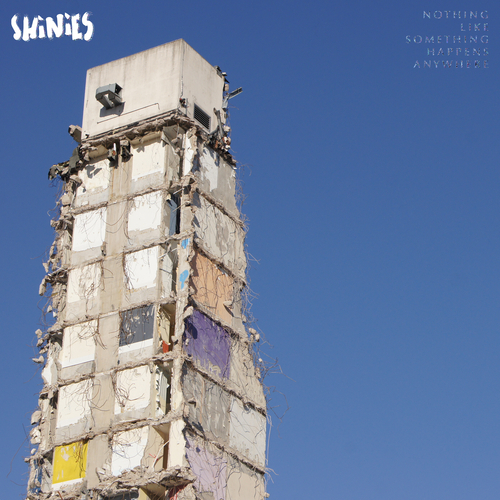 Title track ’Nothing Like Something Happens Anywhere’ begins with the characteristic soft swell of Ric Stringer’s guitar work but unfurls surprisingly, reminding us just why we fell in love with Shinies in the first place. With the two sharing vocals throughout the record, Tom Haben on drums and Joe Fisher on bass complete the line-up. Elsewhere on the record, the lo-fi surfy ‘Beached’ screeches and screams along its rickety iron tracks and ‘6s & 7s’ shows the group breaking new ground. With its slower groove and laid bare vocal, it’s reminiscent of Yo La Tengo and Connan Mockasin, suggesting future directions. In a time of struggle and nostalgia for a time that never was, Shinies remind us to keep our heads down and carry on.